A Cape Town-based artist who has exhibited across three continents, Lionel Smit’s first solo exhibition at Everard Read, Obscura, plays with the idea of the relationship between the seen and the unseen. Hung over two floors of the airy Waterfront gallery, Smit explores this idea through the juxtaposition of the portrait and the abstract. This comparison by contrast is expressed beautifully in his paintings. In Plunge, for instance, the viewer is treated to a finely crafted, delicate explosion of paint revealing a masterful relationship between the fragile, serene stillness of the model’s gaze and the wild sweeps of colour. Instead of obscuring the finely drawn form, the chaotic layer of abstraction enhances it. The hues are a stunning amalgamation of blue and yellow, from deep navy to aquamarine, accented with bright gold and touches of green. The overall effect is reminiscent of a starry or sunny sky. Smit explores the concept of ‘obscura’ further. In some paintings, such as Plunge, the portraits appear to have existed before layers of colourful abstraction were applied. In others the portraits seem secondary, superimposed on a wild, abstract background. In Singular #1 for example, the subject matter and composition remain the same as Plunge, yet the fine taupe outline of the figure’s translucent form floats on a riotous canvas of colour, ablaze with burnt orange and red and splashes of blue. 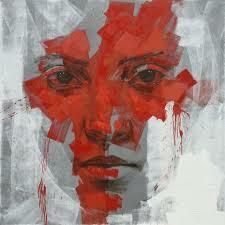 Disappear, the largest painting in the collection, is an evocative work of fragmented portraits. Classically beautiful studies hover against a pale pink canvas streaked with delicate blue drips, reminiscent of rain, punctuated by a bold slash of yellow. The result is a clash of form and abstraction, with the gritty feel of graffiti and a delicate wash of colours. An intriguing and intricate confluence of contradictions, Obscura #1 stands out from the collection. Unfinished elements of the portrait, indicated by the briefest of lines, are contrasted with detailed brushstrokes on the face, while the flat dark grey background is shattered with vibrant slashes of glowing tangerine. Smit explores this theme across multiple media. His sculptures are perfectly finished yet deliberately fragmented busts of the model, often cast in bronze but retaining the organic feel of clay. The silkscreens, such as Merge With Yellow and Rorschach Residue, whilst still beautiful, do not have the same impact as the paintings. They lack the raw energy and gestural feel of paint and in keeping with the medium, feel flat and ‘mass produced’ compared to the unique paintings. The least successful medium in the collection however, is Smit’s photographs. Every image depicts the model’s face covered in paint – a conceit seen in many advertising campaigns. As the paint obviously covers the model, there is no intrigue as to what came first or what is obscured. Neither raw nor lush, when hung midst the astonishing paintings and sculptures, the photographs feel like an unnecessary afterthought. Smit admires artists who, in his own words, use “The human portrait to create something extraordinary”. In Obscura Smit proves that he undoubtedly deserves to join their ranks. The Lionel Smit exhibition, Obscura, runs at the Everard Read Cape Town gallery until the 17 February 2015.